I’m a week late in posting this installment of the cheese master’s story because I spent all of last week at Disneyworld on a family trip, and that wasn’t conducive to posting (though I did finish a conference paper!). This wouldn’t be worth mentioning, except that there’s an odd way in which the experience of being there gave me some insight to these blog posts, and to my larger project on Gatchina: it takes so many people to keep a concern of this size running smoothly. The number of employees there (oh, wait, excuse me, Disney, “cast members”) is astonishing, and it made me think that Disneyworld is probably the thing in the modern world that’s closest to working on the scale of one of the imperial palaces, with all its buildings and grounds to care for. And in the case of Gatchina, when the the town was part of the palace administration too, that was even more pronounced. 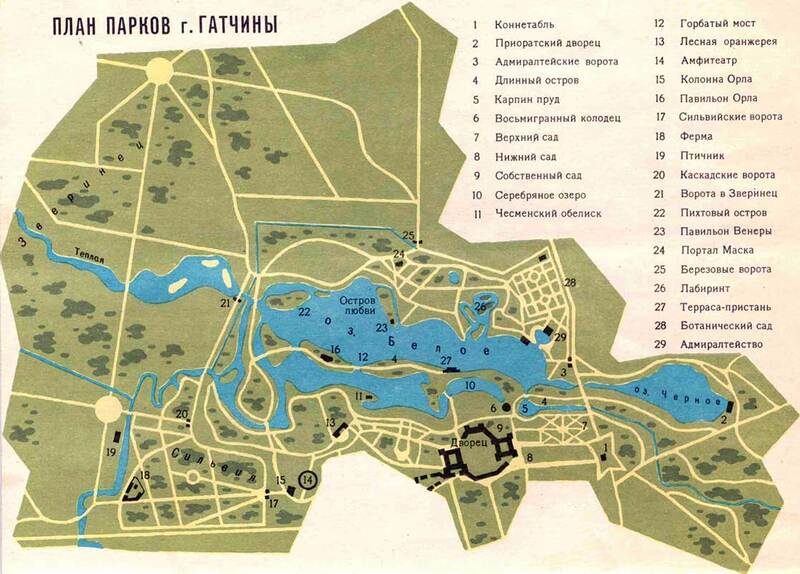 Map of Gatchina parks, from Turistskoi karty “okrestnosti Leningrada”. In the cheese master’s story, many of the people who worked in and around Gatchina appear, at times interacting with him during his life, at times overseeing the process of dealing with his estate. There’ve been a number of them already in these episodes, from the peasant hundreder Pavel Spiridonov who found the body and the regional officials who helped to identify it and to compile lists of his property, to Unge, the ober-amtman who oversaw one of Gatchina’s districts, and who helped deal with Tinguely’s possessions, to Buksgevden and Ramburg, the nobles on whose properties the body was found or who had agreements with the dead man. There are others who play important roles in the story of Tinguely’s life and death—or at least in the archival file. The highest ranking are the St. Petersburg civil governor, Dmitrii Fedorovich Glinka, who received reports from district officials and who sent them on to Gatchina authorities, and Petr Khrisanforovich Obolianinov, then the head administrator of the town of Gatchina (and also General and Cavalier). Those titles, though, are a bit misleading. One might expect the governor to be the person with greater authority and rank, but in the files Glinka sounds slightly defensive in his letter to Obolianinov. Obolianinov had evidently written to Glinka chastising him for taking too long to tell the Gatchina authorities about Tinguely’s death, and Glinka responded with a list of the reasons it had been impossible for him to write earlier. He is clearly trying to say that he was not guilty, that the man had been unknown, and that identifying him had simply taken time (ll. 31-31ob, August 23, 1799). Why such deference and defensiveness? It might have been his own insecurity. Earlier that year he had already survived being fired for incompetence, and then being reinstated within weeks and granted lands for his trouble, part of a series of events that made the insecurity of life during Paul’s reign particularly clear. But the deference probably had something to do with Obolianinov himself. Obolianinov’s title as head administrator of Gatchina dramatically understates his role in the reign of Emperor Paul. He was one of Paul’s favorites, and like so many favorites, played multiple roles in the emperor’s reign—he was, in particular, the Procurator-General at the end of Paul’s reign. He’s far less known than figures like Arakcheev, perhaps because he failed to carry his influence into the reign of Alexander I, but at the time he was likely as much of a figure of possible fear. Petr Khrisanforovich Obolianinov, from Moskovskoe dvorianstvo v 1812 godu [Moscow], 1912. Scan from the Publichka. The archives are slightly kinder to Obolianinov than Waliszewski (and at least one etching is, too). He appears somewhat gruff—it is he who demands that the administration get back Tinguely’s cheeses from Ramburg, and Glinka’s letter suggests that his tone towards him was rough—but neither incapable nor lazy. In fact, he also shows up trying to make other people do their work. The file includes a letter from the Gatchina Town Administration to Tinguely from earlier in the summer, complaining about his failure to fulfill his contract. The contract, signed two years before, stated that Tinguely would take on ten students, and teach them “cheese mastery as you know it and also animal husbandry and medicine, for a period of two years, and when it passes present them to the administration.” However, the term had recently passed, and “no students had been presented by” Tinguely. As a result, Obolianinov, described with all his titles, demanded that Tinguely give his ten students an examination to prove that they had learned something, and to present them to the administration in fulfillment of his obligations (l. 43). That letter isn’t directly followed up on in the files, but there is other news of Tinguely’s cheese-making students. Unge, the ober-amtman, wrote several times to the Gatchina Administration for instructions on what to do with the remaining students (perhaps those earlier ones, perhaps a new batch). In the first report, from August 15, he told the Administration that there were fifteen Gatchina students who had already received a stipend in advance for the whole month. He asked the Administration to leave him “two or three” of them, which would be enough for him to carry on the cheese-making operation, and to send the rest of them to work in the palace gardens until the end of the stipendiary period. Two weeks later, on September 2, he wrote again, complaining about the students who had been left with him. Andrei, the best student, had been ordered away, and Matvei and Fridrikh, neither of whom were “fit” for cheese making, had been left with him (ll. 20-20ob, 25-25ob). Again, too, the file makes it clear that Tinguely was leading rather a complicated economic life. Just as he produced cheese both on the account of the Gatchina administration and on his own account, he took students from Gatchina and from elsewhere, too. 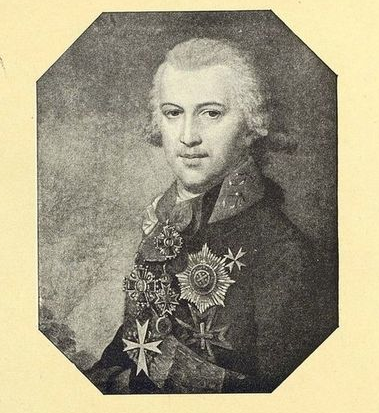 There had been the promised students of General Ramburg, only one of whom appears elsewhere in the file—the first list of his property notes that in his lodging on the Ramburg estate, there were “one student and one woman, for whose food the tavern owner should be sent 10 rubles” (l. 5). A later letter cleared up who the woman was: the soldier’s wife Maria Ivanova Shenshina, who had worked for Tinguely at Novaia Ivanovskaia, and who asked to be paid for her work and to get her passport back, and who also claimed that Tinguely had promised her his two featherbeds and old chest (l. 24a). Unge also reported that Tinguely had taken on private students at Gatchina itself: two from fraulein Protasova, one from Bakunin, one from Skurin, and one from General Kushelev (l. 20ob). What happened to them is unclear. It seems that the cheese making students from Gatchina were simply moved to another task; at some point in September, the Administration wrote to Gatchina’s master gardener, sending him the former cheese making students (l. 37). They were apparently to shift their focus and learn gardening. Presumably the private students were simply sent back to their owners (possibly their employers, but probably their owners). These events wrapped up one part of Tinguely’s case, in that they took care of the people most directly associated with him at Gatchina. But there still remained another set of people to think about: any possible heirs to his estate. Finding them turned out to be the next task of the local administration, and that investigation uncovered yet another layer of Tinguely’s story. This entry was posted in Imperial Russia, The Case of the Dead Cheese Master, Uncategorized. Bookmark the permalink.